What are some traditional Turkish dishes people can have in Istanbul? Ottoman Turks were affected by the surrounding cuisines in the Mediterranean, Middle Eastern, Balkanian and so forth. As a result, Turkish cuisine has mind blowing dishes all over the country. You are lucky, if you are going to be in Istanbul, because you can pretty much find anything there. I don't think I can cover the entire Turkish cuisine here, but I will try to share all of my favorites. It is made with a hand-rolled pastry called Yufka -Turkish flat bread that is made thin round unleavened flat bread similar to lavash. Yufka is folded over various ingredients such as spinach & feta cheese, spinach-feta-minced meat, spinach-feta-egg, seafood, egg, minced meat, patatoes, mushrooms, etc., then baked on a griddle. It is made of lamb intestines, mostly suckling lambs and sometimes goat meat. Variety lamb meat is piled on a skewer, then wrapped up with intestines to hold them together. It is grilled for a long time on a horizontal skewer as you can see in the picture. A portion is cut from the whole stack, then chopped finely while it's being mixed with variety of Turkish spices and herbs. It is usually served in Turkish bread with chopped tomatoes. Amazingly delicious when paired with Ayran (Turkish yogurt drink) or beer. Turks are fish lovers. Usually, the fish from Marmara Sea or the Black Sea is so delicious that there almost no need to use sauce for fish dishes. Hamsi, anchovy, season starts around fall and ends by spring. Once the season starts, locals get excited about having the best hamsi in town, whether it is pan-fried, grilled, or with Turkish rice pilav. 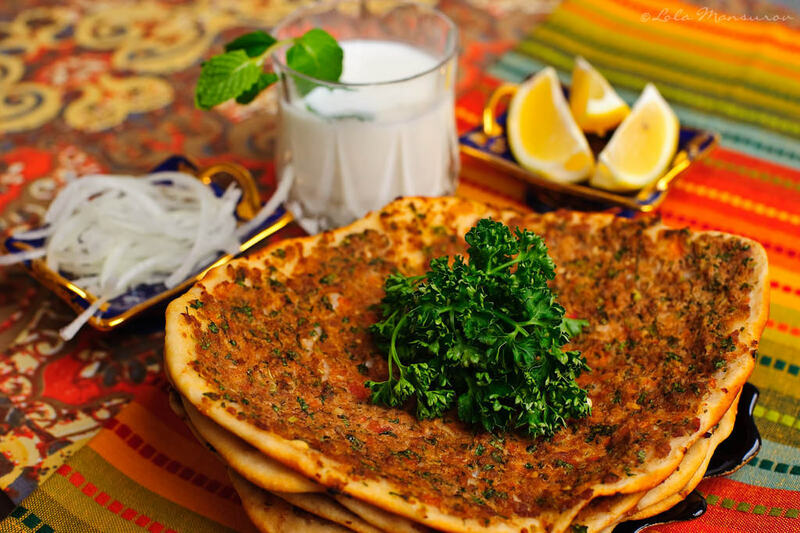 Lahmacun is the Turkish pizza that has minced lamb and beef, and minced vegetables, tomatoes, onions, and spices & herbs. It is stone oven baked with wood fire. It ends up being crunchy, and a lot thinner than pizza. People usually put some greens, squeeze lemon on it, then roll to eat easier like tacos. Ayran is usually people's choice of drink with it. The literal translation of the name of this dish is "The Sultan enjoyed it". I'm assuming that this is one of the creations of the chefs working for the Ottoman Palace. Marinated lamb cubes cooked by themselves, then served on top of a white sauce, which is made with char broiled and mashed eggplants, flour, and milk. The lamb melts on your tongue, and the sauce has a full body taste. Eating this dish definitely makes you feel like a sultan. Dolma: Vegetables either fresh or dried eggplants, peppers, tomatoes, or zucchinis are stuffed with a mixture of rice and onion with various spices. It is usually called Turkish ravioli with yoghurt. Manti dumplings typically consist of a spices meat mixture, usually lamb or ground beef, in a dough wrapper, either boiled or steamed. I guess this is almost a never ending list considering the fact that Turkish cuisine has so many amazing things to eat. I will keep adding more of my favorite dishes in the future. If you'd like to learn more about the street food in Istanbul, then check out this blog post. Where are the best places to see a belly-dance show?